Fruits are the best choice for making the delicious desserts at home. The sweetness of fresh fruit desserts gives a pleasant experience to the food lovers. All fruits have their unique flavors which makes them first choice to consume in different desserts. There are various fruits like pineapple, banana, mango, strawberry, and blueberry by which you can make some delicious desserts for at home. You can also prepare mouth-watering cakes using the fresh fruits flavors. Today, we are giving you a gluten-free mango cake recipe. Before making the cake, we should know about the nutritious qualities of fresh mango's. The mango is known as the king of fruits because it is rich in selenium and iron. Mango is one of the best nutritious fruits in the world. It also contains many nutrients like vitamin C, vitamin A, antioxidants, and immune booster which are helpful to stay healthy. Eating mango also prevents cancer, lowers cholesterol, improves eye health and clear the skin. All of the unique qualities of mangoes make it best fruit for your health. 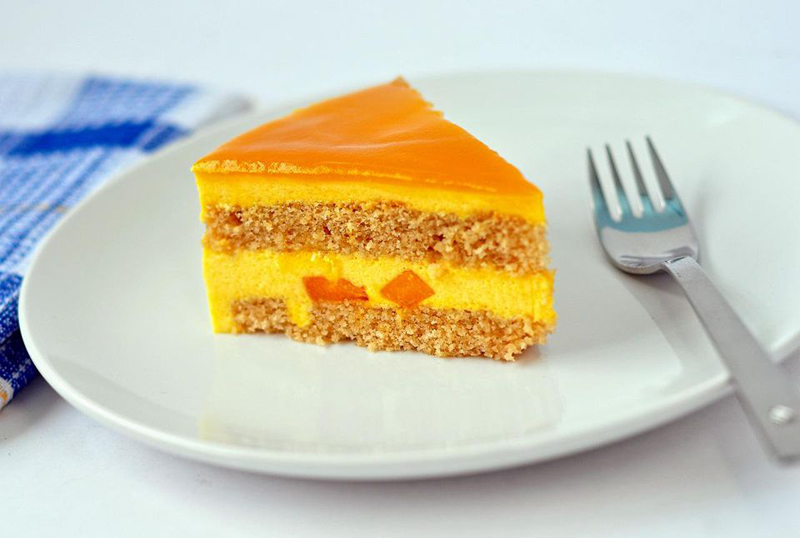 You can also eat mangoes by making delicious desserts like tempting birthday cake, anniversary cake, and wedding cake to celebrate your memorable days of life. Here is an easy gluten-free mango cake recipe to make at home. ¾ cup of refined brown rice flour and ½ cup of sorghum flour. Four eggs at room temperature. A half cup of granulated sugar. One tablespoon of xanthan gum. The first step is to preheat the oven to 180°C (160°C fan-forced). And grease it to make it non-sticky for the preparation of cake. Peel and cut the mangoes and add the pulp to a blender to make it smooth. Now take brown rice flour, coconut flour, baking soda, salt, cardamom powder, and sorghum flour. Then mix the dry mixture Then add milk, vanilla, butter, and eggs in the same bowl and mix it gently using a mixer. Try to take time to mix it well so that there will be a smooth mixture of these ingredients. Take a separate bowl, add the blended puree of mangoes, butter, vanilla and sugar in the same container. Then mix it gently until smooth. Now add the flour mix to the mango puree bowl and mix it slowly. Don’t overmix the ingredients. Take a cake pan and pour some coconut oil on it. Bake it for 40 to 50 minutes until cake gets golden brown and check with a knife inserted in the center comes out clean. Try to bake it properly for the better taste. Now take the delicious cake carefully for cooling in the room temperature. Try to loosen the edges with a knife while flipping the cake on cooling rack. Cool it completely before slicing. Take a bowl, add whipped cream and beat it slowly for five minutes. Then add sugar in the soft cream and mix it well. Now cut one mango and use a blender to turn it into a pulp or thick puree. Add the mango pulp to the fresh whipped cream and mix it gently. Be sure while frosting the cake and it should be completely cooled. Place the cake on the plate and spread about a half cup of frosting on the top of the cake. Use a spatula to spread icing on the entire cake gently. Try to coat side with a very thin layer of frosting to seal crumbs. Now spread the remaining frosting over top of the cake and give a smooth texture. You can also make attractive swirls or leave on the top flat for decoration. At last, take mango slices to garnish the toppings of this cake. You can also make some designer slices to decorate the beautiful mango cake. Refrigerate the cake for 1hours before serving. You can also use food colors for frosting the mango cake. Hope you like this gluten-free mango cake recipe and do give it a try. It also looks delicious when cooked without eggs. It will be the perfect dessert for your memorable celebrations at home. Share the tasty bites of the mango cake with your close ones and enjoy the precious moments.